I now have two fresh Windows systems on totally isolated internet connections, so within a week, I can finally take the time to record a new video of the complete process of how EXACTLY you configure the free, LogMeIn Hamachi VPN solution for for remote backups. 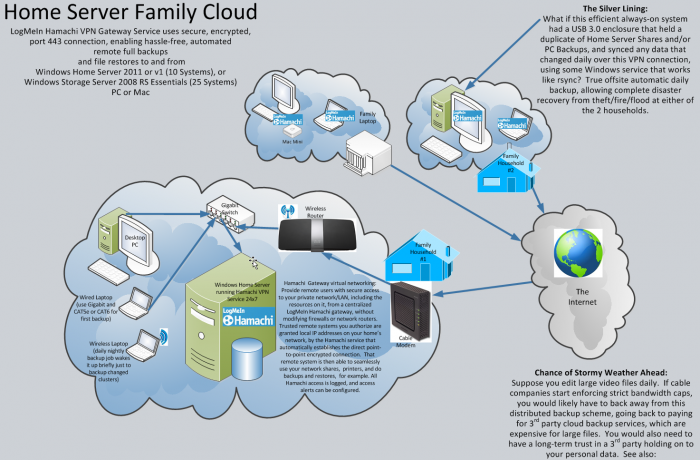 Ideally, you do your full system backup while on a wired gigabit connection in your home, then subsequent daily backups schedule a wake up task that automatically turns on the remote family member's system in the night, briefly. The Hamachi VPN software runs as service and connects automatically, allowing the fast daily Home Server backups to just, well, "work." And only the data that changed since the day before is backed up. In my experience, amazingly, it only takes about 20-50% longer for backups done remotely than over a wired local network connection, since much of the backup time is spent computing which clusters have changed,versus actual data transfer. I'm assuming about 2Gbit/sec upstream internet, so DSL and other lower bandwidth options may make daily backups impractical for you. But since Hamachi VPN is free, you can always give this a shot and see what happens. The recent 4 day power outage due to heavy sticky snow in Connecticut had me exceed my 10GB/month cap on my Verizon MiFi 4510L device. I happily paid $10 for each 1GB I went over, as my extended family visited my house, to warm up, and borrow the internet (now that I have a new generator). But now power is back, and a new Verizon montly billing cycle has begun. And my primary Cox internet connection is now up as well, so I'm good to go as far as infrastructure, with two isolated networks ready for me to use again. I'll admit, the setup and configuration may take you about an hour for 2-3 systems (if you're not familiar with Free LogMeIn Hamachi, the video will get you through step by step). But I also strongly feel it's well worth the effort, because the reward for your effort will be the ability to allow automatic remote daily backups of your PCs, even when those PCs aren't always in your home. And those users can also do file level restores and access your network shares that you allow them access to, as if they're on your home's network. Note also that I've already done the "proof of concept," with my 3 year old Windows Home Server v1 system faithfully doing daily backups of 3 of my extended family's remote systems for about 6 months now. 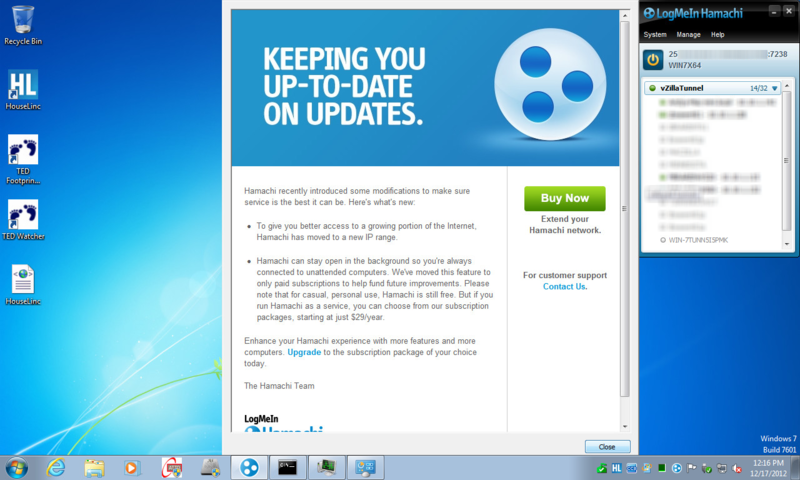 I've also rehearsed and tested and am now ready to demonstrate how to set this up for Windows Home Server 2011 as well. That's it! The Home Server is intended to be left running 24x7, so it's a great place to install the Hamachi Service. No special router configuration required. Unfortunately, there's a new business model announced by LogMeIn about running Hamachi as an always-running-automatically service.